Vegas World developer FlowPlay has announced the launch of its back-end development platform, giving developers the chance to create their own custom social casino games with reduced development time and increased monetization opportunities. As a result, Joju Games has created the first standalone game on the platform, Fringo. The Vegas World technology platform is said to cut development time in half for new social casino games, which can be created for the web, Facebook, iOS and Android smartphones and tablets. The platform offers tools for in-game advertising and a network of more than 20 payment providers, including major credit cards, pre-paid cards and PayPal. The platform’s analytics dashboard allows developers to view up to 300 metrics, including player location and revenue, payment methods and more, while also tracking the effectiveness of marketing campaigns. Games developed on the platform can be built with private and public chat rooms, virtual gift “sharing” features, and other social interactions. The platform is built around the world of MMOs, providing support for thousands of players to enter a game and compete against each other, while retaining the proper in-game gambling economy. 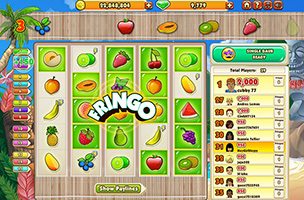 The first game developed on the platform, Joju Games’ Fringo [pictured], combines slot machines and bingo, and is already available on multiple web outlets, including VegasWorld.com. The game will come to Facebook and Android devices later this year. “The industry is incredibly saturated, and developers are hungry for a way to differentiate their social casino titles. True innovation will come when developers expand beyond single-player slot games to offering unique, multiplayer titles that foster a truly social experience,” said Derrick Morton, CEO of FlowPlay. More information on FlowPlay’s Vegas World development platform is available on the company’s website.